The “Deluxe Version” of this album includes 4 bonus tracks that are only available digitally. Take two steps in his shoes and you’ll give them back. Take a look at his past and you’ll close your eyes. But it is through his pain that Crytical, a versatile South-Seattle MC, has found the inspiration to present underground rap fans with one of the most honest, reflective and hard-hitting reality rap albums of the year. “Crytical Condition,” the debut release from Crytical, provides an aggressive and often painful look at the circumstances that shaped and continues to influence his life. Standing firmly on the foundation of the growing Seattle rap scene, Crytical’s powerful voice – whether viciously dominating the mic or blowing smooth vocals – delivers a freshman effort that rivals the honesty and grit of many of Hip Hop’s legends. Add the fact that “Crytical Condition” is backed by the talented Street Level Records’ family and you know you are listening to a true representation of Northwest talent. 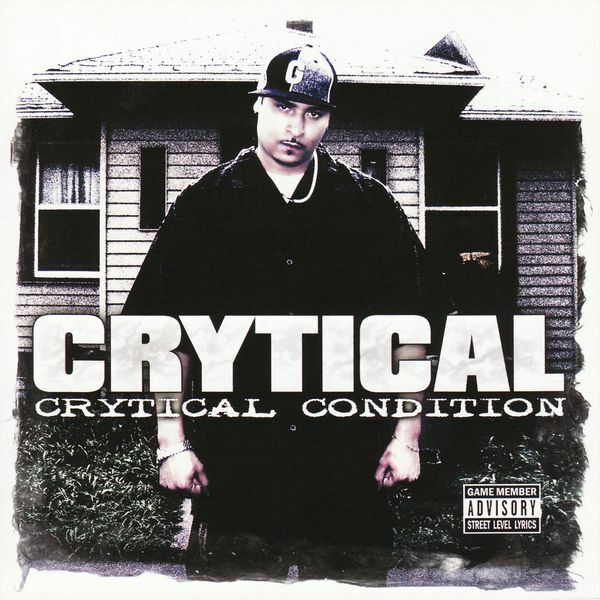 “Crytical Condition” includes the instant Seattle anthem, “The Sun Doesn’t Shine” featuring C.O.L.A. & Twin-G and drops a hood classic with “Life of a Rider” featuring Killa Tay & 151. “My Troubled Life” shares the painful experience of living through a father’s drug addiction and incarceration while “My Everything” thanks his mother, wife and children for inspiring him through the years. True to Street Level Records’ reputation, Crytical’s debut album offers a raw, inspiring and blatantly accurate soundtrack to the Seattle streets. “Crytical Condition” is the product of over three years of hard work and a lifetime of paying dues including serving as hype man for his friend and fellow Seattle MC, Byrdie. Those efforts paid off when Crytical was introduced to Street Level Records CEO and Executive Producer, Mr. D-Sane. Having opened for national artists including Twista, Yukmouth and Dru Down, Crytical’s powerful flow and versatility made him a natural addition to Seattle’s premier independent rap label. Look for more from Crytical on other Street Level Records’ releases and guest appearances on other Northwest productions including “My Life for Sale ” by Neema of Unexpected Arrival.